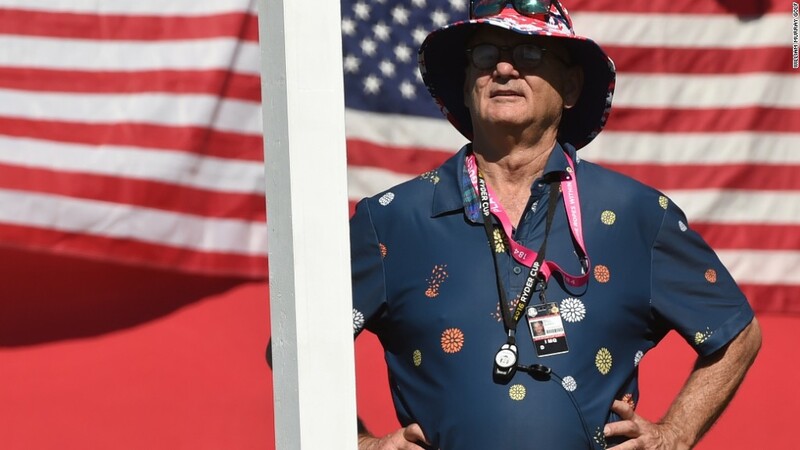 Bill Murray marches to the beat of his own drum -- in life, in movies and now on the golf course. "If you've seen photos of Bill on the golf course, he's quirky with his fashion sense. He'll wear plaid on plaid with a plaid bow tie," said his younger brother Joel. Those fashion eccentricities aren't limited to the well-known actor. "All of the Murray brothers are quirky with clothes," said Joel. It launched this month with Bill as the face of the brand, which means it's loaded with playful irreverence. Bill Murray wearing the Cinderella Story polo shirt. Think bright colors, playful prints and clever references to Murray's movies. The logo itself is a faceless Bill throwing away his golf club. There are bright tartan shorts, tartan button-down shirts and, Joel's favorite, a polo shirt with tiny whiskey glasses printed all over it. "Every couple of glasses, there's a glass tipped over with whiskey pouring out of it," he said. Another shirt, the Cinderella Story polo, features brightly-colored mums with a few random ones falling apart. It's an homage to the movie "Caddyshack," a classic Bill Murray film, which features a scene where Bill lops a row of mums with his club. Ed Murray, Andy Murray, Brian Murray, John Murray and Joel Murray wearing the William Murray Golf Collection. "Things have gotten pretty stale in golf clothing," Joel said. "We need to inject a little fun into it. This could help get more millennials into the sport." His own son, who's 25, prefers to play an abbreviated 6-hole round on the course. The Murrays partnered with theChive, a photo-driven website with a huge male fanbase, to develop William Murray Golf. The collaboration started two years ago after the Murray Brothers discovered theChive had created a fun Bill Murray T-shirt that was a top seller. "At first we were flattered. But Bill wasn't getting anything from it," said Joel. The resulting partnership has theChive's team handling design, production, distribution and sales, all of which require input and clearance from the Murray brothers. The clothes (priced between $32 to $90) are sold online at WilliamMurrayGolf.com and theChive.com. "We're very hands on," said Joel, who's in charge of the brand's day-to-day business decisions. "All of us look at the designs. Bill speaks up if he thinks something isn't crazy enough." 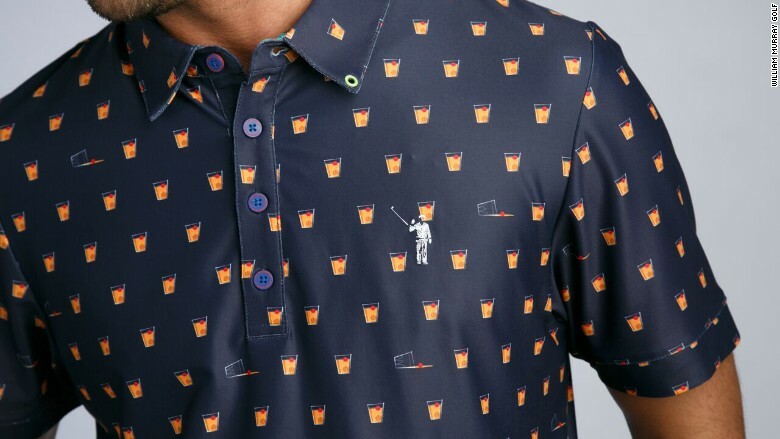 The tipped-over whiskey glass golf shirt. Joel pegs the Murray humor, love of golf and distinct fashion style to the family's upbringing in the North Shore of Chicago. Bill, for instance, rarely wears polo shirts on the golf course. "He hated getting hand-me-down polos from his older brothers. So he mostly wears button-down shirts on the course," said Joel. Golf was like a religion in the family. "We were all altar boys. One by one, we were recruited coming out of church to train as caddies," said Joel. "It was hard work, subservient work, two things that we realized much later on that we weren't interested in." Yet, all six brothers were inducted into the Caddy Hall of Fame in 2015. 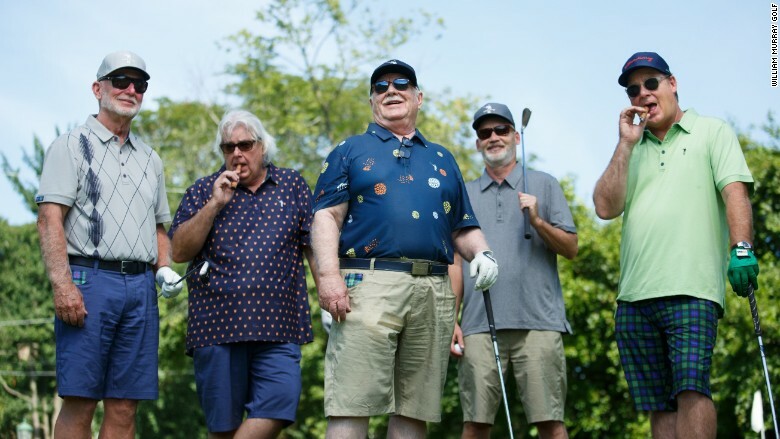 "It was a great honor for all of us," said Joel, adding that the brothers still get together every year for their Murray Bros. Caddyshack Charity Golf Tournament.